When our customers call for a limousine, they want to know if our limo service drivers are reliable and safe. Anyone can obtain a driver's license, but to be a top notch limousine chauffeur takes considerably more training. And our limo chauffeurs are the best trained and most professional you can find anywhere on the planet. Usually the training process consists of a five-day Limo Training Program which will enable the chauffeur to enhance present driving abilities and people skills. Such topics as communication, tourism, and proper route designs, are fundamental necessities for the professional limo chauffeur. Our drivers are all required to take part in these classes. While at these classes, the driver will be expected to attend lectures, take an active part in all class discussions, and work on individual exercises and activities that the instructor proposes. Those wishing to have professional limousine chauffeur training must attend all these classes and other activities connected with the course, which our drivers do. All courses are designed to follow the municipal licensing and standards of the geographical location in which they are given, and must comply with governmental regulations pertaining to professional limousine chauffeurs. Our limo chauffeurs are well-trained professional drivers who have successfully passed these courses. As our limo chauffeurs are meeting new people every day, and each customer has different expectations and needs, we train our drivers to be proactive and to put their many skills to good use with each customer. This gives the customer a sense of security and ease. The importance of this training can't be underestimated. Subjects that are addressed include common driving errors, the reduction of accidents, and first aid/CPR training. We also insist on time to time inspections of our cars. There are also refresher courses that seasoned professional drivers can take. These usually last about two days and take into consideration all the basics plus such other subjects as appearance, techniques of driving, and anticipating the customer's wants. A poorly-dressed limo chauffeur reflects on the company for which he works, and our drivers are always attractively and neatly dressed. 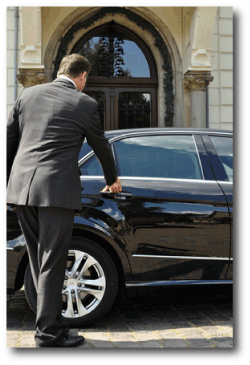 We also pride ourselves on our chauffeurs' code of behaviour and availability for the customer's needs at all times. Our drivers are pleasant and polite, making the trip more enjoyable for all concerned. When you call for one of our limousines you can be sure that all aspects of Chauffeur Training have been completed to the satisfaction of employer and licensing bureau. We insist on professionalism and customer satisfaction at all times. When you have experienced a trip with us, you will have had a safe and pleasant drive, and when the subject of limousines comes up again, our name will be on your mind.